Texas multiple award schedule (TXMAS) contracts that have been developed from contracts awarded by the federal government or any other governmental entity of any state. As the responsible federal entity, the General Services Administration’s (GSA) Federal Supply Service awards Federal Supply Schedule contracts by competitive procurement procedures for more than 50 schedules that cover multiple commodities and services. The prices reflected on GSA schedule contracts are the most favored customer (MFC) prices and the maximum price allowable. TXMAS contracts take advantage of the MFC pricing and under certain circumstances, an agency or local government entity, may negotiate a lower price for the goods or services offered on a schedule contract. A “best value” purchase can be made by following the TXMAS purchasing procedures. Solutions and service provided by SYSTEC Group are on the TXMAS Program. 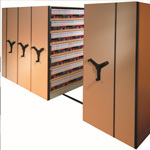 SYSTEC Group offers a wide array of storage solutions for many types of organizations. For offices solutions include complete lines of high density shelving systems, rotary file system, labeling, and document conversion.